"Puyo Pop Fever is finally here and it's time for gamers to start popping those bubbles... err... puyos!" The classic NES game, Puyo Pop been revitalised for the PlayStation 2 and Sega's addictive puzzle game once again promises gamers fun, frustration and one fantastic time. 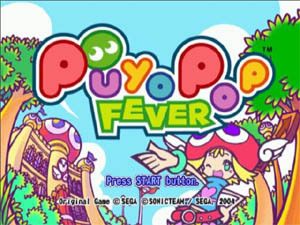 Although the original incarnation of this classic puzzle game has been known by many names in the gaming kingdom, Puyo Pop is the original name and in its basic essence, is a game about bubbles, pops, puzzles and of course the new Fever mode that allows a variety of players to go head-to-head in some of the most action packed puzzling in decades. Puyo Pop was designed by the creators of Sonic (Sonic Team) for Sega Japan but fortunately the rest of the world (even GameCube and XBox) can now enjoy this highly addictive title. 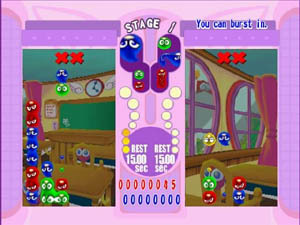 The game is similar to Tetris where players must line up different colour bubbles (puyos) into other bubbles. The catch behind this game is that players must match their puyos with other colours. For instance, a red puyo must be lined up with another red puyo but in order to pop these puyos, you need four consecutive puyos of the same colour. The game really heats up when you play against another player (either computer or human) and whoever can pop their puyos the fastest, basically wins the game. Fortunately for gamers who have never played Tetris before or the Puyo Pop series, there is a tutorial that recaps the rules behind this entertaining game. Amitie is the cute little tutor for this title who is dressed in a pink dress with a mushroom hat. The game also contains a variety of different characters from good-hearted characters to mean-spirited ones who the player can either control or play against. 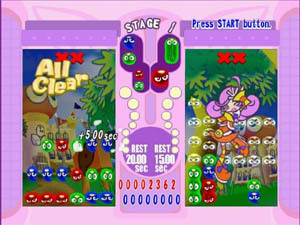 Apart from the usual standard Tetris rules, the developers have included a variety of "extras" into the game such as the inclusion of gigantic puyo's that are worth about four regular puyos, joined puyo's that contain two different colours and a variety of other oddities that helps spruce up the gameplay. Graphically Puyo Pop Fever is a strange looking game that is extremely reminiscent of Japanese games from the mid 80's to early 90's. This is not a bad thing mind you and also gives the game a "kitsch" factor that you can't help but fall in love with. The game is divided into two screens with your left screen being used for the main player and the right screen used for your opponent. All the backgrounds in the game use still images but the bubbles or puyos move with this eerie water like effect. The puyos themselves are extremely cute and contain a variety of different expressions from anger to bemusement and really helps draw the gamer into this strange world of puzzles and multicolours. Although the game is primarily a 2D game, the developers have included a variety of 3D effects that interact with the gaming environment and keeps everything dynamic. 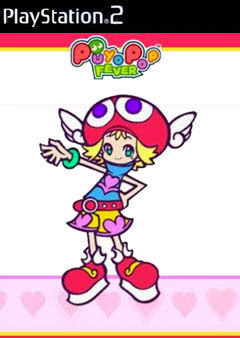 Musically, Puyo Pop Fever has a very Japanese anime style soundtrack to it that one can't help but dance along to the merry tunes that are littered throughout this title. The in game sound effects contain the usual pops and beeps but add some entertaining and cutesy voice acting and you have the perfect Japanese puzzle game. In conclusion, Puyo Pop Fever is a great game, especially if you are playing with another player. I would recommend this game to anyone who enjoyed Puzzle Bobble or Tetris as this game combines the two titles into one addictive and entertaining title.